“The foundation of the deprivation of the descendants of Fatima s claim of Fadak was laid in the time of the First Callph. After the martyrdom of Ali, Mu awiyah assumed the reins of government and divided Fadak amongst three persons (Marwan, Amr bin Uthman and his own son, Yazid). During the preriod of the Caliphate of Marwan, all three shares were assumed by him and he gifted them to his son, AbdulAziz. He, in turn, gave the same to his son, Umar. On account of the fact that Umar Bin Abdul Aziz was an upright person from amongst Bani Umayyah, the frist heresy which he removed was that he returned Fadak to the descendants of Fatima. After his death, however, the succeeding Umayyad Caliphs again took away Fadak from the Bani Hashim and it continued to remain in their possession till their rule came to an end. During the Caliphate of Bani Abbas, the question of Fadak vacillated in a strange manner. 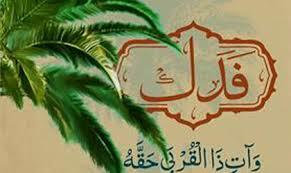 For example, Saffah gave it to Abdullah Bin Hassan and after him Mansur Dawaniqi took it back but his son Mahdi returned it to the descendants of Zahrah. After him Musa and Harun took it a way from them on account of some political considerations. When Ma`mun assumed the office of caliph, he handed it over formally to its owner. After his death, the conditions of Fadak vacillated once again and it was returned at one time to the descendants of Fatima and then taken away from them again.